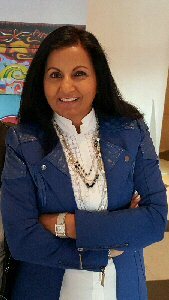 OTTAWA, ONTARIO--(Marketwired - March 7, 2016) - Almas Jiwani, President Emiratis of UN Women Canada and CEO of Almas Jiwani Foundation will sit on the National Mentorship Panel on Tuesday, March 8th, 2016. The event will be broadcast live across Canada between 5:00 P.M. - 6:30 P.M. EST from Ottawa. Startup Canada, Microsoft Canada and Moxie Trades are partnering together to launch the #FindOneBeOne Campaign to support women in finding and becoming mentors and to celebrate and raise the ambitions of women across Canada through showcasing role models and connecting them with mentors. "The session will shed light on the obstacles that women in leadership roles face in Canada today which is an important part of the work that we do and the policies and legislation we aim to inform through this work," said Almas Jiwani on the occasion of the announcement. "I hope to the able to provide actionable guidance to Canadian women leaders and also take away insights on what more needs to be done." "Almas Jiwani's passion and impact in empowering and advancing the status of women globally, combined with her authentic and personal approach to leadership and diplomacy make her a role model for all Canadians," said Victoria Lennox, Co-Founder & CEO of Startup Canada. "She will be a featured panelist for a national broadcast mentorship panel from 5pm - 6:30pm ET, where she will be celebrated as a Canadian role model and she will mentor the nation, answering questions coming in live from across Canada, on topics ranging from the role of women in the economy to the day in the life of one of Canada's foremost civic leaders. International Women's Day is about celebrating women, and she embodies that in everything she does." This is going to be an intimate yet significant event as women leaders from the nonprofit, Government, corporate, and academic sectors will come together to discuss what they can individually and collectively do to empower Canadian women.